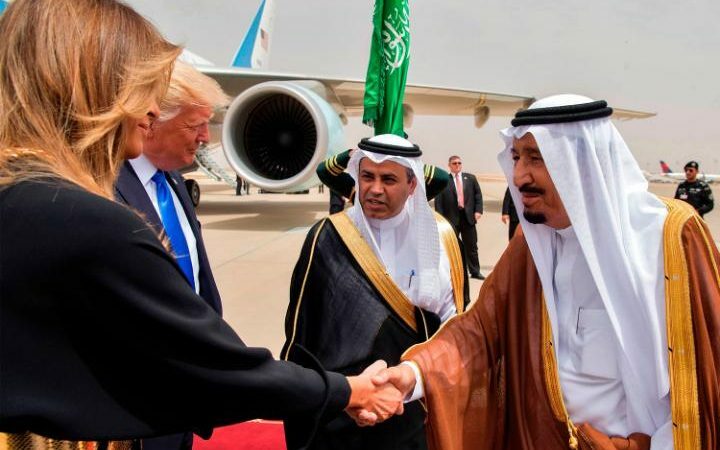 Dazzling superhero and real life wonder woman Melania Trump arrived in Saudi Arabia without the mandatory requirement of a restrictive head scarf as she joined her husband on his first foreign trip as President of the United States. King Salman greeted the pair at the Royal Terminal of King Khalid International Airport in Riyadh, alongside other senior officials from the Middle Eastern kingdom. The glamorous First Lady did not cover her hair upon arrival in the conservative Islamic kingdom, where a strand of female hair on public display has been known to cause catastrophe, disaster and pandemonium. Another strong female in power, Prime Minister Theresa May also decided not to abide the strict dress code in the conservative country, saying she wanted to be a role model for oppressed women. Do you hear that Hilary? Strong women do not conform to socially designed and enforced expectations of them and know their worth and value, whilst also not standing by unlawful men who cheat on them. Yep, so much for female empowerment. Saudi Arabia has strict practises when it comes to women in public spaces: they are required to wear a full-length robe and cover their hair. Some women wear a Burka which covers their entire face with a veil. Because women possess corrupt and monstrous faces which turn men to stone, obviously. Though why some Muslim women still continue to wear these oppressive devices in western countries where the sight of actual real life women is not met with acts of violence and terrorism and sexually deprived religious men unable to control their perverted urges, we will never quite know. In Saudi Arabia restrictive laws are in compliance with the guardianship system, which limits women’s movements and enforces a ban on female drivers. During his two day visit, Mr Trump is expected to make a speech urging Arab leaders to “drive out the terrorists from your places of worship” and will throw his support behind the country, while simultaneously criticising the Assad regime in Syria for its “unspeakable crimes against humanity” and Iran for contributing to its spiralling violence. The US president will also likely announce a $350 billion (£268.5 billion) arms deal with Saudi Arabia, one of the largest of its kind in US history. While feminists everywhere should be applauding Mrs Trump in female solidarity of her stand against a sexist and oppressive ideology, you are more likely to see Hillary Clinton attempt a 3rd run for President of the United States than a feminist admitting they are a shameful hypocrite at heart. We don’t know about you, but we can never imagine Mrs Trump wearing a Burqa anytime soon. For the way she and Mr. Trump conducted their Saudi Arabian visit we absolutely applaud them and as a result, it was also respected by Saudi Arabia Authorities.